Peter Greenaway's work is full of, perhaps, unintentional ironies, firstly that one so interested in reviving cultural 'visual literacy' should make films that are so wordy. 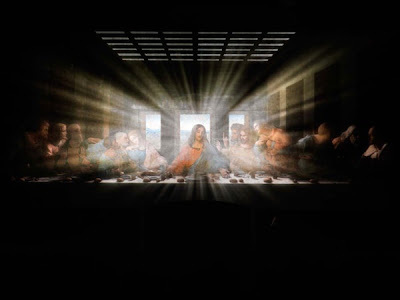 Secondly, here at the North Melbourne Town Hall's Arthouse, his multimedia installation of Leonardo da Vinci's 'Last Supper' explores paint and place through projection on a facsimile of the original. Image and object have become interchangeable. The work is part theatrical set-piece, part wordless lecture it is interesting in part for its production values and also for the way it closes down the space in which we see the familiar diners but leaves their meanings open. The space created here in a Melbourne (in an inner suburban Town Hall which isn't a million miles away for the unprepossessing location of the original in Milan's Santa Maria Delle Grazie) is walled with black drapes, in the middle is a long white banquet table set with white porcelain detritus of the meal, as if it were a washed out vanitas. At one end is a facsimile of the last supper, complete with alcoves, arches and the invading doorway that cut off Christ's feet. At the other end, at least initially, is a reproduction of Donato's Crucifxion, which faces the 'Last Supper' in situ. Multiple projections wash back and forth over the fresco. The effects are impressive. The brilliant illusionistic modelling of Leonardo's disegno is brought out as shadow is cast to emphasise the effects of perspective. We get a sense of the passing of time and daylight upon the room and into the picture, seeing shadow from the room's windows move across the wall and over the painting as well as the effects of the changing hours on Leonardo's internal pictorial light sources. That light appears natural and then spiritual, in doing this Greenaway doesn't attempt to give the painting a halo but he does remind us of its role within a monastic refectory. It would have been easy to concentrate on the narrative of the image, creating a slideshow tableau vivant, but instead Greenaway's eye is analytical, searching for Leonardo's technique. The hands in the image are gradually isolated, showing how they direct attention and reinforce the groupings within the composition. This is a mercifully Dan Brown Free Zone. The opposite end of the space is what makes this more than an Old Masters in Imax experience. The crucifixion dissolves and a camera zooms into the surface of the painting. We go down to the level of each flake of paint as it clings, agianst the odds and its creator's flawed technique, to the plaster. The effect is more than an essay in conservation light it helps us feel how images exist as objects, created from pigment on a surface. The fragility of the original ghost on the wall is heartbeaking but here we remember the power of the remnants that still retain Leonardo's intent. I've been lucky enough to make the pilgrimage to Milan's airlocked treasure, and whilst Greenaway can't quite replicate how it dominates and integrates with the space he retains a critical sense of scale, although raised as if on a platform or a low dais the scale is so human that the passion and grace in the figures on the wall acts as a mirror on the diners below. This 'Last Supper' isn't a perfect work. 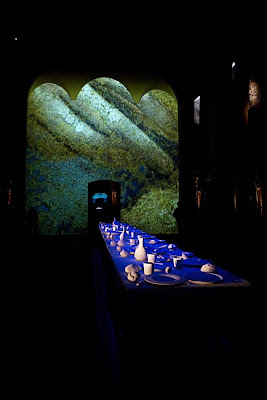 The table running down the centre is unnecessary set dressing, in fact as it is treated like an object of veneration itself, with repeated exhortations not to touch it, it reminds us that we're in the art world and not in a refectory. The music too, a kind of amplified portentous chamber music, suggests a drama in progress where Greenaway's eye is far more subtle and gentle. 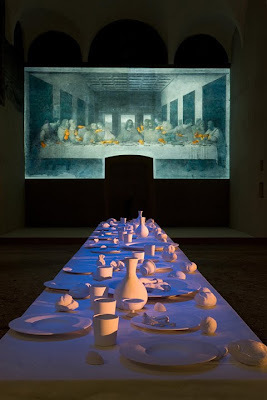 The last thing the 'Last Supper' requires is further layers of interpretation, in understanding this Greenaway pays Leonardo a huge compliment, the absence of theory and backstory privileges the paint on the walls, the patterns it creates and their presence in a room. It is a loosely forensic approach but one that demands we look and think, rather than listen and believe. You might hope that it will catch on.